I’ve got a weeknight dinner for you in the midst of all the holiday eating chaos. 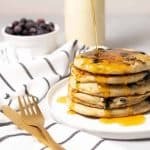 As much as I love baking and spending endless hours in the kitchen this time of year, I also love stocking up on easy weeknight dinners. Slow-cooker, Instant Pot and sheet-pan dinners are getting me through these busy days. It seems like the moment we roll the clocks back for daylight savings time, I turn into a hermit. Gone are the days when I feel like doing anything after work; I prefer to be home, in my pajamas and asleep by 9PM. There’s just something completely gratifying about hunkering down when it’s cold and dark; like our own form of hibernation. This sheet pan dinner came out of such a night. I didn’t feel like driving to the store and didn’t have much in my fridge. After a little experimenting, this meal was born. 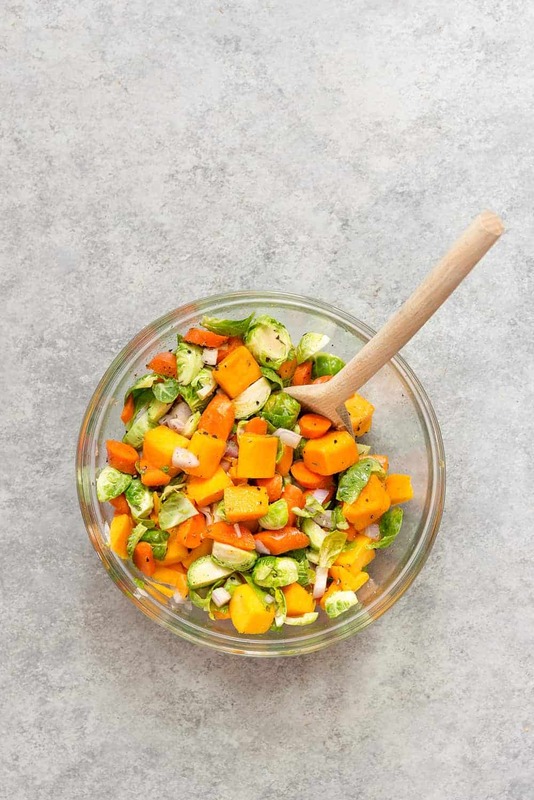 A quick marinade for the tempeh and a generous seasoning of the vegetables. Throw everything on a sheet pan and ta-da, dinner is served. I really like tempeh, but know that it might be foreign for most of you. If you’re brand new to tempeh, then I actually recommend trying this sausage recipe first as it’s completely fool-proof and you’ll get a better handle on how to manage the texture. I’d also recommend cubing the tempeh into bite-size pieces; too large and they won’t get crispy and browned on the edges, which is what this recipe is all about. It’s why you want to cook the tempeh first before adding the vegetables. The tempeh only gets better the longer and crispier the edges get. I can find tempeh at most of my grocery stores and at Trader Joe’s/Whole Foods but if you can’t find it, then substitute in tofu instead. Marinade it in the same way, then bake it along with the vegetables. This meal is hearty enough to enjoy on it’s own, or pair with your favorite grain or salad. I served this with couscous and it was delicious, especially if you make extra marinade sauce to drizzle on top! 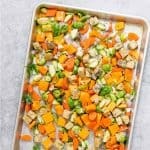 Sheet Pan Maple Balsamic Tempeh and Vegetable Dinner! 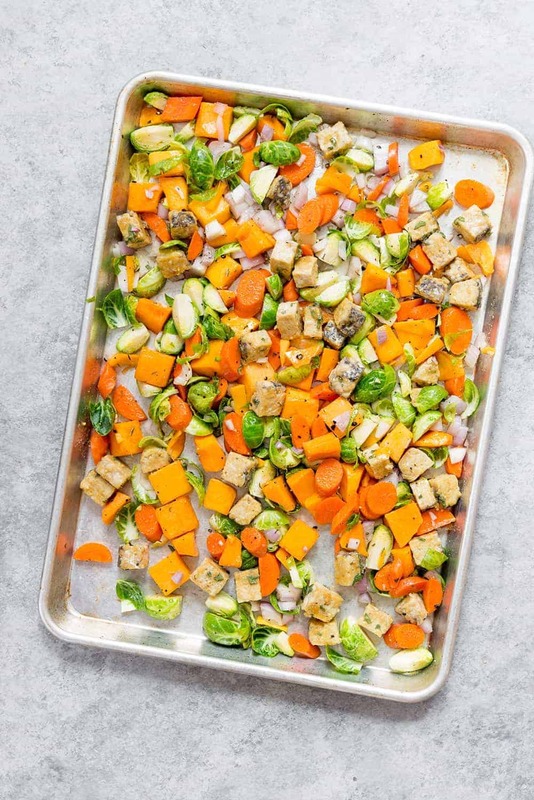 If you’re looking for a delicious sheet pan vegan dinner, then this is it! 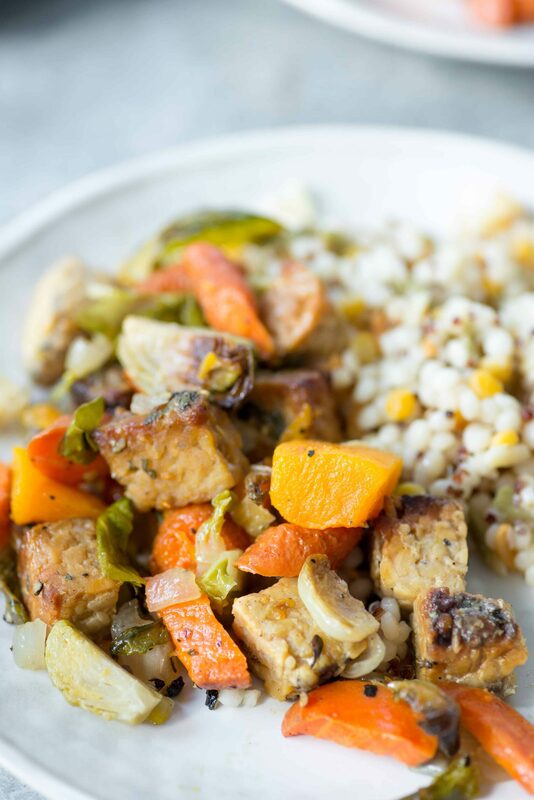 Roasted maple balsamic tempeh with tender fall vegetables. Preheat oven to 425 degrees F. Lightly spray a baking sheet and set aside. Toss the tempeh with all of the ingredients for the maple-balsamic sauce: olive oil, mustard, maple syrup, thyme, sage, balsamic vinegar and soy sauce. Add to the baking sheet and cook for 10 minutes. 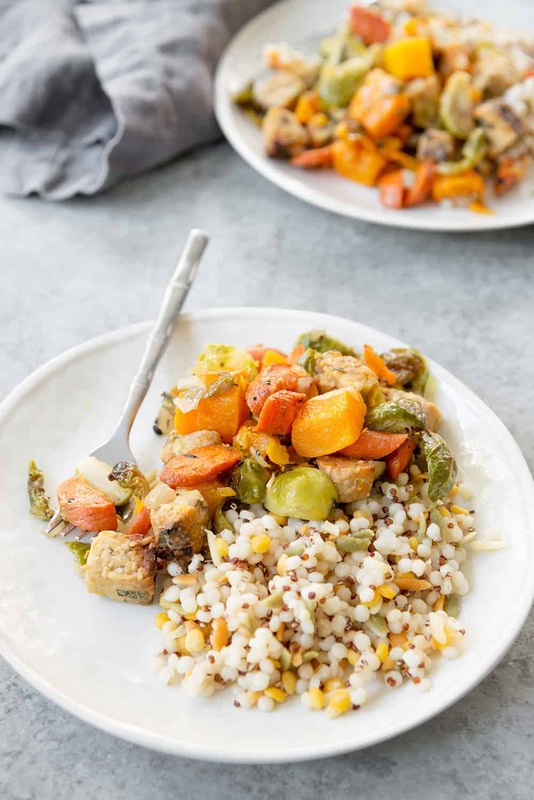 While the tempeh is cooking, toss together the vegetables (squash, shallots, sprouts, carrots) with olive oil and salt and pepper. Remove the baking sheet from the oven and add the vegetables, spreading out in an even layer as much as possible. Bake for 25 more minutes, or until vegetables are almost tender. Whisk together the remaining maple syrup, balsamic, soy sauce and dijon mustard. Drizzle over the vegetables and return back to the oven and cook another 5 minutes. We love this as is, but it’s also delicious with any grain of choice! Bookmarked! 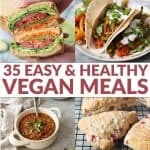 I love tempeh and have been trying to compile a list of yummy recipes to make on the regular.. this definitely makes the cut! thank you for sharing! can’t wait to try it at home and report back with my results! Thanks Sophie! Let me know what you think! It’s totally delish! My kids usually hate vegetables but AMAZING! they enjoy the dish and asked me make vegetable dishes only like this way. LOL!!! Yay!!! So glad you liked it- thanks Sophie!